The Old City of Sana’a, Yemen, World Heritage site. The United Nations announced that consultations on Yemen, previously scheduled to kick off Sunday, would instead begin on Monday, 15 June, in Geneva and that Secretary-General Ban Ki-moon would attend. “Coordinated by the United Nations Secretary-General's Special Envoy for Yemen, Ismail Ould Cheikh Ahmed, the Consultations mark an important step as the parties embark on the road towards a settlement,” UN spokesman Ahmad Fawzi told reporters at the UN briefing in Geneva. Meanwhile, the UN Office for the Coordination of Humanitarian Affairs (OCHA) welcomed the announcement of an allocation of $100 million by Kuwait to allocate to help the people of Yemen. This is party of a larger donation from Kuwait that also included $200 million for strife-torn Iraq. The World Health Organization (WHO), meanwhile, reported that the most recent casualty figures in Yemen as a result of the conflict was 2,584 deaths and 11,065 people injured. UNESCO reports that the early hours of this morning, the Old City of Sana'a, a UNESCO World Heritage site, was hit by a bombing raid and several houses and historic buildings were destroyed, causing human casualties. “I am profoundly distressed by the loss of human lives as well as by the damage inflicted on one of the world's oldest jewels of Islamic urban landscape,” UNESCO Director-General Irina Bokova said in a statement. The agency reported that in this morning's raid on the Yemeni capital, the buildings destroyed, the agency said, was the “magnificent complex of traditional houses” in the Al-Qasimi neighbourhood. “This heritage bears the soul of the Yemeni people, it is a symbol of a millennia history of knowledge and it belongs to all humankind,” she said. UNESCO created the idea of World Heritage to protect sites of outstanding universal value as part of its mandate to protect heritage and support for cultural diversity. Sana'a has been inhabited for more than 2,500 years and bears witness to the wealth and beauty of the Islamic civilization, according to UNESCO. By the first century, it emerged as a centre of the inland trade route and its houses and public buildings are an outstanding example of a traditional, Islamic human settlement. Sana'a's dense rammed earth and burnt brick towers, strikingly decorated, are famous around the world and are an integral part of Yemen's identity and pride. Since the beginning of the conflict in Yemen, UNESCO reported, several houses within the heritage city of Sana'a have suffered damage and collapses as a consequence of shelling and explosions. On 9 June, the Ottoman era Al-Owrdhi historical compound, located just outside the walls of the Old City, were severely damaged. Historic residential buildings, monuments, museums, archaeological sites and places of worship have not been spared. “The historic value and memories enshrined in these sites have been irreparably damaged or destroyed,” it said. On the humanitarian front, the International Organization for Migration (IOM), said there were disturbing reports regarding stranded migrants in Yemen in the city of Haradh who were in a life threatening situation. And WHO said between 27 March and 4 June 2015 there had been more than 3,000 cases of Dengue fever recorded in Yemen. Unconfirmed reports from the national authorities suggested that the number of cases of Dengue fever, especially in the Aden Governorate, could be much higher. 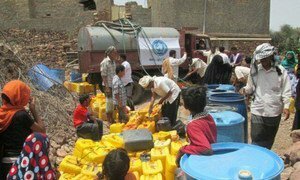 Some 20 million people in Yemen – close to 80 per cent of the population – urgently need humanitarian assistance, several United Nations agencies are warning, as the conflict, which escalated dramatically in March, continues to take its toll in what was already the poorest country in the region.